SAVE £14.85 when you buy a Mix and Match Ceramic Knife Set. Each colour is available in four sizes; 3in, 4in, 5in and 6in and you can choose your colour for each blade type. We know many a customer would like to customise their sets of Rocknives, so we've introduced the new 'Mix and Match' to allow exactly this to happen. Now you can choose your own colours for each of the available sizes in one simple place and we'll send you the Display Stand absolutely free. Please note that the orientation of the stand screws may differ from as shown on website photographs. All sets come with a 6 inch Professional Chef's knife for general all round work about the kitchen, a 5 inch slicing or filleting knife, ideal for poultry or fish, a 4 inch paring knife for peeling fruit or finely slicing vegetables and a 3 inch herb knife for fine chopping small vegetables, herbs and berries. 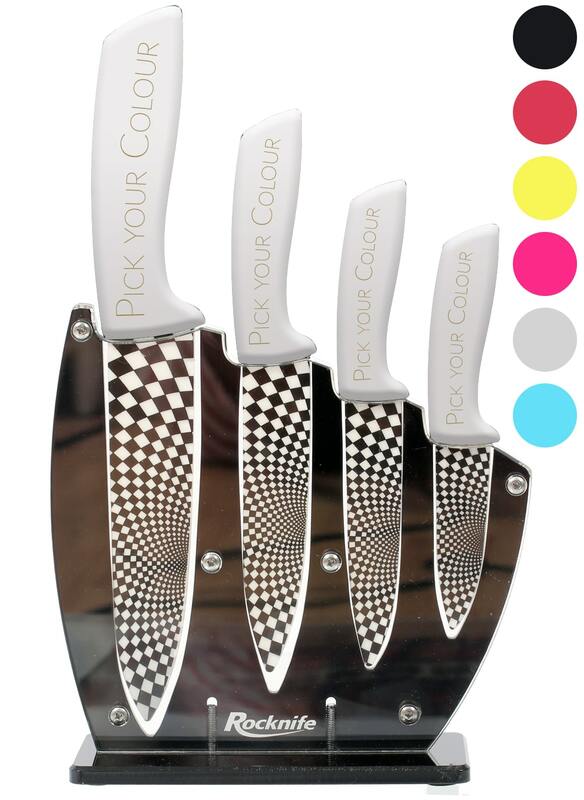 The original Rocknife comes with a black and white chequered design on the blade and in professional black for smartness, blood Red for eye catching statements, Lime Green for freshness and vibrancy, bright Pink for lively and modern kitchens, Cool Grey for ultra uberness and Aqua Blue for trend-setters. All knives come with a protective cover for storage and the stand can be free standing on your kitchen worktop or wall mounted for ease of access. Rocknife is the new statement kitchen product for the 21st Century, we truly hope you enjoy yours for many years to come.